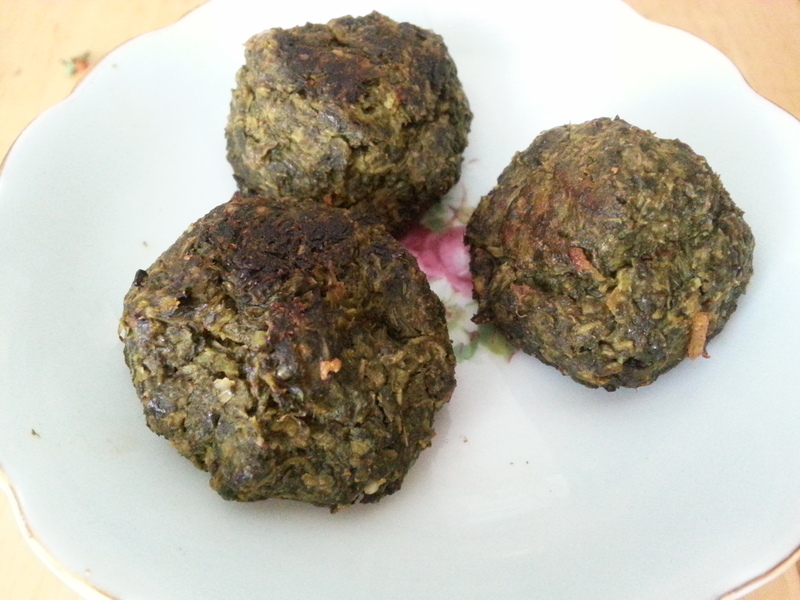 These spinach pakoras do not taste like your average fried pakoras with lots of batter. Here the spinach is the star of the dish. It is really easy to make and freezes well. I used a food processor to grind and mix all the ingredients together. I found though that I had to add each ingredient one at a time, because the spinach would tangle the blades if I put all the ingredients in the bowl straight away. These pakoras are great as a side dish or as an appetizer. Add the onion to the food processor, then the cilantro, followed by bits of the spinach. Add all the other ingredients and mix until well combined. Form into 1 inch round balls and place on an oiled tray. Bake for about 15-20 minutes at 400 F. ¾ way through, flip the spinach pakoras, so that each side browns a little.